Oppo HA-2 SE review | What Hi-Fi? Ever fallen for the same joke twice? We almost did upon our first viewing of the new Oppo HA-2 SE. Being near-identical to the original HA-2, we yet again tried to peel back its stitched leather cover. It looks like it should open like a smartphone case, but sadly doesn’t. The new ‘special edition’ version is the same pocket-friendly aluminium slab (12mm thick and weighing 175g), with the same neat volume dial in the top corner, and battery indicator on the side panel. The only thing you could circle in a spot the difference competition is the printed model name on the back, which now fittingly adds an ‘SE’. We praised the original HA-2’s portability, compatibility and creative design, giving it an Award as our favourite DAC under £400 last year. 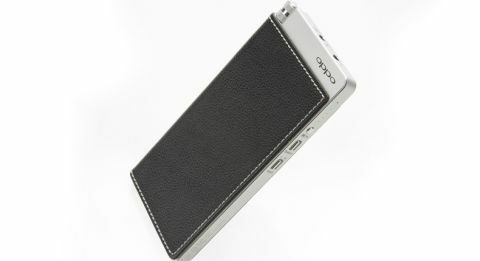 The decision to keep the same appearance suggests that Oppo’s design team felt hesitant to mess with something that works. The HA-2 SE’s spec sheet triggers another case of déjà vu. Like the original, it supports PCM files up to 32-bit/384 kHz and DSD256. Connectivity is good – there’s a microUSB input for Android smartphones, PCs and laptops, a USB type-A for Apple products, and 3.5mm input for everything else that doesn’t have a USB connection. That means you can connect almost any source. The 3000mAh battery takes about 90 minutes to charge and offers around seven hours of listening with digital sources and 13 hours with analogue. It can also top up your smartphone’s juice. Once again, a ‘high gain’ mode – a switch on the right hand-side – means it’s capable of driving power-hungry headphones. It can be just at home with a pair of Shure SRH1540 over-ears (£400) as it is with Soundmagic’s E10C in-ears (£40). Any scepticism that this is essentially the same product soon disappears though. Oppo isn’t trying to pull the wool over anyone’s eyes by simply adding ‘SE’ and £40 to the asking price. The new iteration uses the new and improved ESS Sabre 9028 chip and small component changes are claimed to have reduced the noise floor. This may not sound particularly revolutionary, but it shines through in the performance. Thankfully, the original’s dynamic, articulate and detailed sound still provides the solid foundations of the HA-2 SE’s presentation, but it’s as if it’s been stretched at both ends. There’s now more expression and openness at the higher and lower frequencies, making the delivery tighter and more precise. Play Destroyer’s Hell and the Oppo’s top end opens up to let the dramatic violins express themselves, with all their scratching and swooning. In comparison, they feel a little squashed through the standard HA-2. There’s plenty of texture and dynamic fluctuation to the melody-setting saxophone and Dan Bejar’s characteristically bold vocals, which go from moodily morose to light and playful, are swathed in feeling throughout. They’re direct too, gushing over the top of the instrumentals with stark clarity and focus. The jazz arrangement is rhythmically sound, the Oppo breezing through the track with energy and crisp timing, revealing its progressive giddiness. With the lower frequencies, this DAC balances depth with suppleness well. The tonal balance is pleasingly neutral, although the ‘Bass Boost’ setting gives more emphasis to the low-end and more thump to marching drums in Wildbirds & Peacedrums’ Peeling off the Layers. However, it also takes the limelight off the vocal delivery, so we prefer it off. The HA-2 SE’s only niggling problem is the Audioquest DragonFly Red USB DAC. Not only is it £100 cheaper but it also delivers a slightly subtler, more rhythmically surefooted sound. The more versatile Oppo has more features though, making it one of the budget DAC market’s most important offerings – and not just its biggest prank puller.